For our final school break, Brad and I took the opportunity to see iconic Australia. We traveled the outback! As you read this blog, please comment if you would like to see anymore photos than what we posted, and let us know what you think. We had too many to post them all, and have put up what were highlights for us. 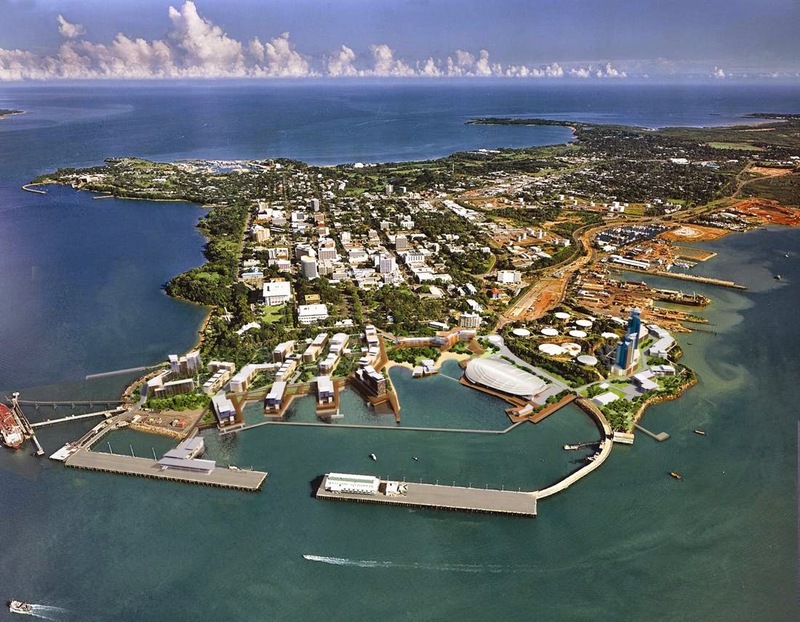 First stop was Darwin in the Northern Territory. Brad and I spent two days on the esplanade before meeting our tour company. Darwin has it's own character, it's not an easy climate to live in so it's not for anyone who isn't tough as nails. They talk about people being affected by Tropo, a condition that is very real and very aggressive during 'build up' right before the 'big wet'. I'm referring to two of six seasons in Darwin. The ratio of women to men is about 1:20. The views were just a glimpse of what we were about to see later in the week. Just your average lunch choices in Darwin. All set and ready for our pick up to head out on our adventure. We traveled on a 4WD bus with about 15 other people from all over the world. 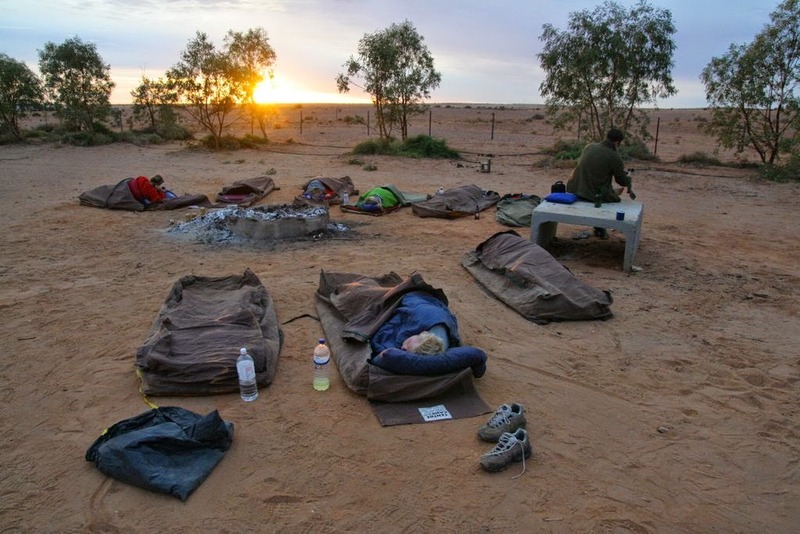 The first three days were spent in the 'Top End' of the Northern Territory, while the last three were spent enroute to Alice Springs. Who can resist the classic tourist opportunity?! The first day required a lot of road to be covered, as did most of this whirl wind trip. Our tour guide ensured we were fed and watered every few hours to make sure we were comfortable. These were very typical stops on our journey whenever we needed fuel. Litchfield National Park was our first tourist destination. Here we saw huge Cathedral Termite mounds and these Magnetic Termite mounds. It reminded me of a cemetery because the mounds look like headstones and all face the same way. Next stop, our first watering hole at Wangi Falls. Brad and I swam over to the falls, you can only imagine how the water felt pelting down on our shoulders. There was a easy trek up and around the falls and we had just enough time to do that too. Wangi Falls from one of the lookout spots. It is the dry season so the waterfalls aren't rushing as much as they do when it starts to rain. This spot, as with most of our spots on this trip, get completed flooded out. Crocodiles fill the waterhole, but conservation officers control the crocs as water levels drop to allow tourists and locals a safe spot to swim. We took in a Pudakul Aboriginal cultural tour. Graham & his daughter Deanne shared knowledge and stories of their people. It was a big first night, and we were pretty excited to see our beds for the night. We call this 'glamping' and we even had a double bed! We were up early the next day to do a boat cruise on the Mary River. This is a good time of year to visit the river, I was amazed that the water levels rise another ten metres! No swimming in this river, its full of dangerous Saltwater Crocodiles and Freshwater Crocodiles that are about 4-5 metres long. 'Keep your hands in the boat' is a very real message on this cruise. Kakadu National Park was our next stop. The road into the next few places required very sturdy and aggressive 4WD vehicles, but even they got stuck and we helped push them out. We hopped on a boat to travel up river and then hiked in to see Twin Falls. Above is the boat launch, below is another breath-taking view of our journey to get to the Falls. In order to see water flow from the falls, you need a helicopter as this place is only accessible during the dry season. To help appreciate the size of these falls look to the bottom and slightly to the left. There is a camera crew doing a photo shoot for a travel magazine. After the first hike, we did another staggering bouldering session to get into Jim Jim (pictured above and below). The water was cool and safe to swim in. It was so peaceful. It is here that aborigines women take their daughters to teach them about tribal customs and law. On a side note, our trusty vehicle broke down in the middle of no where on the way back to camp. Thank goodness for satellite phones. It was a memorable night because the sky was clear and the milky way shone bright. It allowed for photography lessons while we waited for our rescue. The next morning we made our way to Nawurlandja Lookout. We climbed to the top under instructions 'don't turn around until you reach the top.' And this is the view we saw. Anyone else think it looks like McIntyre Bluff? At Ubirr we learned about aborigines customs and way of life as it once was. There are several stunning paintings all over these rocks. This one is painted on an overhang way up near the top. To take this picture Brad had to zoom all the way in. He thought the artist was exceptionally talented to have figured out how to get this painting where it was. There are lessons to be taught in each of these paintings. At the top of Ubirr we posed for a very silly pic which includes the rock to the right where Crocodile Dundee 'made his telephone call.' That ended our Top End tour, next we headed south. At Katherine Gorge, Nitmiluk National Park we took in a very ambitious kayak adventure. The picture above and the two below are pictures of Edith Falls. We scrambled to get to the top, having limited time to stay and swim. In the picture below we captured a woman jumping to allow for perspective. This place is one I would hope to get to again...it was magical and had three levels of waterfalls to explore and swim in. Pictured above are swags. This photo and the first one of Darwin are the only two pics that weren't taken by Brad or myself but it had to be added to give a real appreciation for what we were sleeping in. But we were sleeping under the stars, with four freshies (fresh water crocodiles) and a eight foot salty (nasty salt water croc) in the billabong just a few meters away, a huge lizard walking through camp, and a mob of wallabies complete with babies in pouches even closer. Spider on my pillow just as I'm about to crawl in for a much needed sleep. Best day ever, and nope I didn't sleep a wink. Bitter Springs at Mataranka Thermal Pools was exquisite. The water was warm and there was a gentle current that carried you downstream while you floated on your back. Once you reached the end, you walked back to the top to do it again. The water at Bitter Springs was so clean you can see right to the bottom. No photo editing was done to these pictures. Pool at Bitter Springs where the stream starts. A true Aussie adventure isn't complete without a stop at the Daly Waters Historic Pub. This place is a landmark on the way to Alice Springs from Darwin, and truly is, "A Fairdinkum Outback Experience." Banka Banka Cattle Station was our last night's accommodation. The last leg of our journey took us through The Devil's Marbles, or Karlu Karlu. This place has significance for the traditional owners (aborigines) as a dreaming place. Most of these legends are not shared with outsiders. Can you see Brad in the picture above? A quick pit stop as we crossed the Tropic of Cancer. Then said goodbye to our favorite guide, Sim-o. Typical view out the front of the bus for the 1500km trek from Darwin. Alice Springs was our final destination on our 6 day outback adventure. It Snows In Australia, But Ballarat Warms The Heart. Two months have flown by for Brad and I and we have done so many exciting things in and around Ballarat. This blog entry focuses on a few local excursions and highlights of the last two months, but it also has a long awaited school focus. Yes, we are actually working in Australia even though our blog is filled with all our holiday adventures. Happy reading! First up, a visit to Ballarat Wildlife Park to stalk the emus. The most adorable Koala that hasn't figured out if he is a boy or a girl, and is the favorite amongst the animal keepers. I learned the game of rugby this year. I made it a personal goal to train and play at least one game while in Ballarat. I did it! I was terrified and excited all at the same time, but I played rugby. The Melbourne Rebels had a number of women that were learning the game and made the trek to Ballarat to play with us. They were very welcoming, supportive, and holy hell could they play. My side lost, but I didn't realize that until four days later. I was having such a great time that I forgot to ask the final score. Thank you to this guy, Luke Miller, for making it all happen. He remained positive and continued to coach us even as our number dwindled from 15 to 4 by the end of the season. Shout out to Nekitta Mutimer, Emily Lowe, and Fi Roberts. Thank you for making this happen! All dressed up for Presentation Night with St. Pat's Rugby Club. Still working on making it on the 100 Pints wall at Irish Murphy's...we have a long way to go. The boat sheds on Lake Wendouree, in front of Pleasant Street Primary. Brad surprised me at work for my birthday. Being an August baby, I celebrated birthdays during summer break. This was my first birthday celebrated at school and he made a big fuss and caught it all on camera. I felt like a princess. This is a typical fridge in the staffroom at work. I posted this because I know how much some staff at home would appreciate everything about this shot. No, we do not drink during school hours and to clarify, the wine and beer are for special events hosted on site, but how awesome does this look?! Coming from a small school I was surprised to see TWO secretaries manning the front line. I also thought the size of the Principal's office quite impressive. And look! THREE laminators...there are also two in the Senior Unit end. Another aspect that I know the staff at home will get a kick out of. This is the very talented Ms. Linda Ogier. Two gorgeous ladies that I have the pleasure to work with, Miss Suzie Armstrong and Miss Jess Nicolin. The students play cricket during breaks, not something you see at home. And how adorable are their uniforms?! So happy that royal blue is my favorite colour. Instant boiling hot water...can we install one of these in the staffroom?! My turn to try a few Aussie sports, first up, cricket. Tried to play tennis against these two pros, didn't stand a chance. How about a little footy? AFL is HUGE in Victoria. Who do you barrack for? I chose the North Melbourne Kangaroos. But I think I'll stick to watching the game for now. Students at Pleasant Street are responsible for raising chickens and collecting their eggs as part of their Year 4 curriculum. The oval after a rain shower where the students play. My trusty Teacher's Aid! Brad got hired on as my Friday support worker and works on call. He is adored by the students at Pleasant Street Primary. It snowed this winter in Ballarat! Yep, snow in Australia, it was the first time in five years. I feel so fortunate to have witnessed the genuine excitement of these children seeing, feeling, and tasting snow, most for the first time. The energy was truly uplifting. Brrrr, Ballarat is the coldest place in Australia but definitely a place that warms your heart. Our next adventure will be posted soon as we have just returned from a trip in the outback and Sydney's iconic beaches.